We left at dawn this morning, aiming to complete the walk before the promised rain came in. We nearly made it. Dawn was a good time to be walking the cliffs around Geevor, Levant and Botallack. Old mine workings loomed out of the low light everywhere we turned and it was easy to imagine a time when they would have been alive with the noise of spinning engines and hammering stamps. At Cape Cornwall we lost the race with the weather. Ahead we could see Sennen Cove, and above it our destination, but the rest of the walk would be in full waterproofs. Before we reached Sennen Cove though, there was one more surprise: at Aire Point the path stops abruptly by a strand of rock that requires a little light scrambling to surmount. 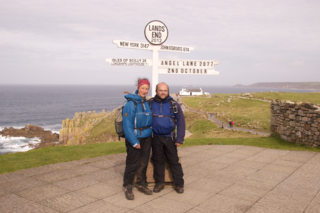 On arrival at Sennen Cove the truth began to dawn: we were half an hour away from completing the country's longest National Trail. Even as I write those words, it doesn't feel real somehow. I first walked part of the South West Coast Path at the age of five or six when visiting Gran in Teignmouth. But I think Shep is to blame for sparking my interest in it. Sometime in the eighties the path was featured on Go With Noakes as John Noakes walked its length with his dog Shep. I decided to walk it one day. Not even the playground rumours that John hadn't really walked the whole thing, but had instead been dropped off by helicopter to film short segments could put me off. Throughout my latter school years and into college, I kept hoping to take one summer out to walk from Minehead to Poole and complete the path in one go. But I never got beyond the vague concept. Maybe expense or loneliness kept me from attempting it. All this to say that the SWCP has been on my mind for thirty years. And now, today, I was to finish it. Better still, I wasn't alone: last year Emma caught up with those sections that I'd walked before we met, so we would finish together. Before long, Land's End. Not even half-way round for those walking the path in order, but today it was our destination. One more National Trail complete, and our headline goal for the year's walking done. It would've been wrong to not have a commemorative photograph. Posted by pab at 16:24 | Comments will be back one day. Please email me instead!